as i mentioned last week, we pretty much spend each valentine’s day the same way. we forgo dining out at restaurant (it’s just so crazy on valentine’s day) + opt to cook dinner at home instead. this valentine’s day we kept with that tradition! 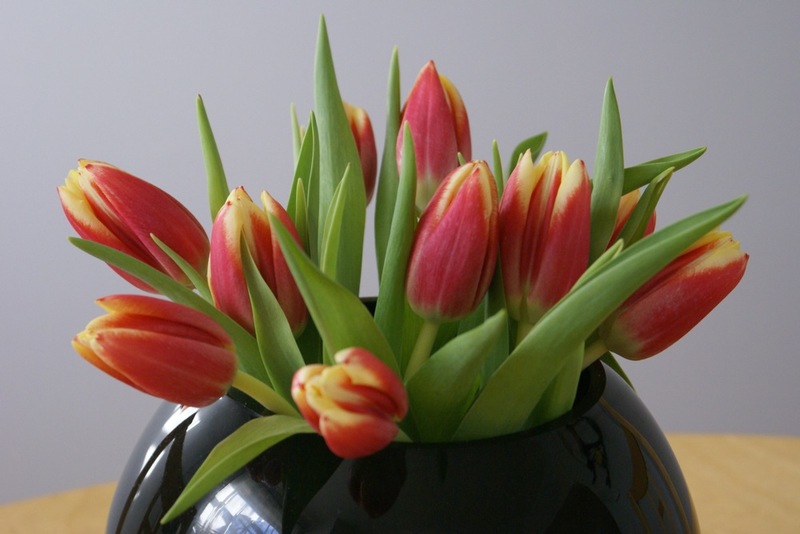 first, i came home to some beautiful springy tulips from my valentine. after enjoying a glass of red wine, we got ready for dinner – we seasoned filet mignon, chopped up potatoes, carrots, + parnsips, prepped brussels sprouts, + minced bacon, herbs + garlic. after some oven-roasting, baking, + grilling, here’s the result! 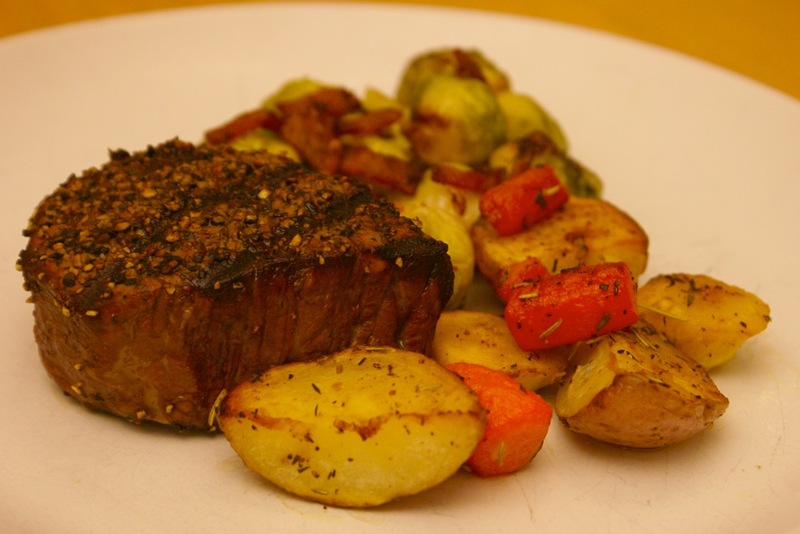 peppercorn-crusted filet mignon (cooked to a perfect medium, just the way i like it), rosemary + thyme oven-roasted root vegetables, + roasted brussels sprouts with garlic + pancetta (recipe below). everything was absolutely amazing. now, on to the recipe! there are many differing opinions about brussels sprouts. some people adore them, some can’t stand ’em, + some are indifferent. personally, i love brussels sprouts, although i have certainly had some less-than-great version of them. this, however, is the tastiest brussels sprouts recipe i have ever tried – the pancetta/bacon + garlic vibe wonderfully with the brussels sprouts. 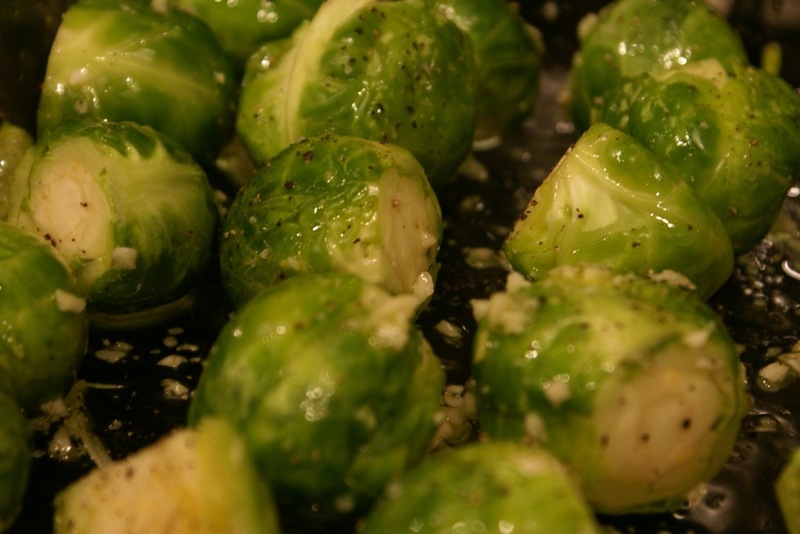 if you still haven’t found the perfect brussels sprouts recipe for you, give this one a try! toss together brussels sprouts, pancetta (or bacon), garlic, oil, salt + pepper to taste in an 11- by 7-inch baking pan + spread in one layer. roast in upper third of oven, stirring once halfway through roasting, until sprouts are brown on edges + tender, about 25 minutes total. stir in water, scraping up brown bits. serve warm. I love brussels sprouts, too and your recipe looks delicious. So glad that you had a wonderful dinner and valentine’s day. thanks, girl! hope you had a great valentine’s day too. I’m someone who loves brussels sprouts, too! Thanks for sharing the yummy recipe. yay, another for team brussels sprouts! =) let me know what you think if / when you make ’em. your dinner looks so delicious, especially that peppercorn crusted steak. wow! i like brussel sprouts too and make a recipe similar to this one. delish! hope you had a great Valentines Day! Your meal sounds good…I never can cook steak right for some reason! 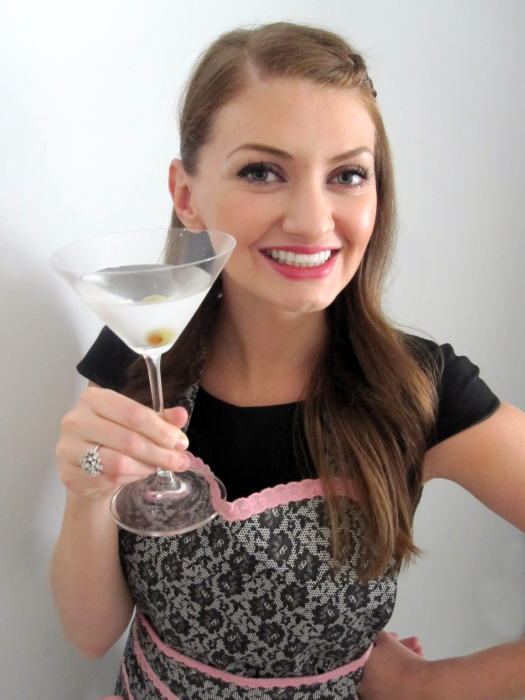 I want to love brussels sprouts, and your recipe could convert me!! We normally go out for Valentine’s, but we decided to bypass the noisy crowds and cook at home. I made garlic-seared shrimp, French Laundry risotto, and salad. Michael brought cheesecake for dessert, and I picked up choc-dipped strawberries. The only thing that compared to the food? Eating in our jammies! Looks delicious! And looks like yall had a great Valentine’s Day! we tried to make it special since by next valentine’s day, we’ll be married! we wanted to have our last ‘unmarried’ valentine’s day be memorable. =) hope your lobster tails turned out amazingly, especially since you’re in the same boat!